Next weekend, 11 and 12 October, Brisbane’s Open House weekend for 2014 is on. Last year I wrote discursively about Open House days here. The range of open houses and other buildings is wider this year, with a variety of reasons for their inclusion, not just historical, but for their architectural or ecological significance as well. And new buildings have been added, such as the ABC studios at South Bank. Last year I spent a very happy day wandering around the city centre looking at public buildings. It was fascinating, particularly looking at ones that are not usually open to the public, like the Masonic Temple on Ann Street, designed by Lange Powell, my grandfather’s older brother, in the 1920s. This time I’m planning to have a peek at some of the open buildings in the suburbs, and maybe get a sense of Brisbane’s domestic architecture as well. Highly recommended. For people in other cities, a Google search will bring up your particular Open House weekend – they are scattered throughout the year. 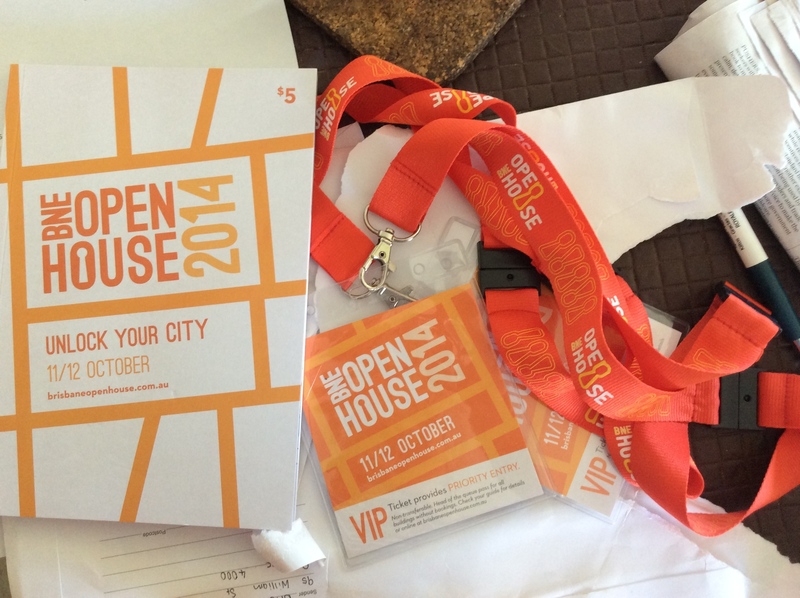 Many thanks to Open House Brisbane’s organisers, who sent me the booklet and VIP passes for the weekend. The very first payola I have ever received for this blog!